I have been thinking a lot lately about language: how it affects our everyday lives, and how it can help or hinder our efforts to communicate with the people around us – friends, family, co-workers. Language has the power to hurt, to heal, and to change the way we feel. If we think about what we are trying to accomplish as musicians, the concept of language and communication is particularly relevant. 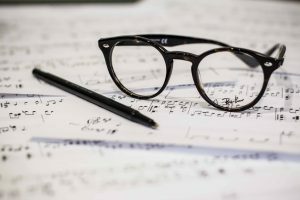 I try to approach it this way: music is the language that we use to communicate what a composer was thinking or feeling when they wrote the piece. Within this language, there are all sorts of tools that the composer gives us – dynamics, tempos, rhythms. As handbell musicians, we can add to those tools a variety of techniques like stopped sounds, LV’s, and shakes. When we put all of this together, we have a truly powerful means of communicating. For us, the uniqueness of our instrument makes putting a musical thought together a challenge. It is like trying to articulate an idea where each word is spoken by a different person. However, we have to make it sound like just one person is talking. This speaking with one voice takes all sorts of skill and rehearsal. It also requires us to listen to each other – another essential component of quality communication. Even as complicated as all of this can sometimes be, the pursuit of this “single voice” is what playing handbells is all about and what keeps me coming back year after year! So, next time you perform, think about trying to speak with one voice to your audience, using music as your language.